Smart watches are passé. 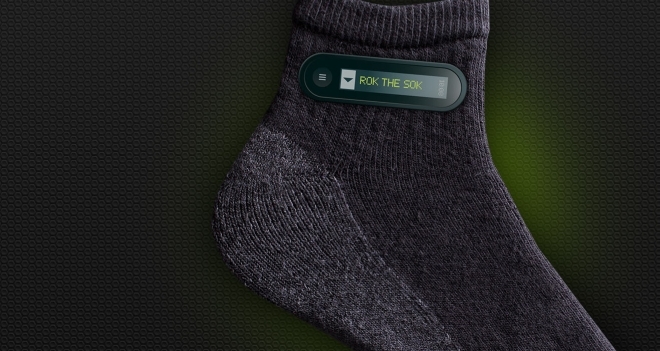 HTC has just announced the RE SOK, the world’s smart sock. The sock integrates a display on the side that shows your phone’s notifications, so instead of doing the bothersome task of pulling the phone out of your pocket or bag, just hold your ankle next to your face. The RE SOK also has a lot of other features. GPS tracking ensures you can find your other sock in case you ever lose it, a system designed to find holes in the sock, superslip coating to make it easier to slide around on hardwood floors (up to 40%), and complete compatibility with all versions of shoes (except sandals; the SOK are programmed to self destruct when used with sandals). The RE SOK are not machine washable or hand washable or any kind of washable, and come in three different shades of identical black color. Stay tuned for our full review of this astonishing invention that is sure to change the way you do things with your feet.